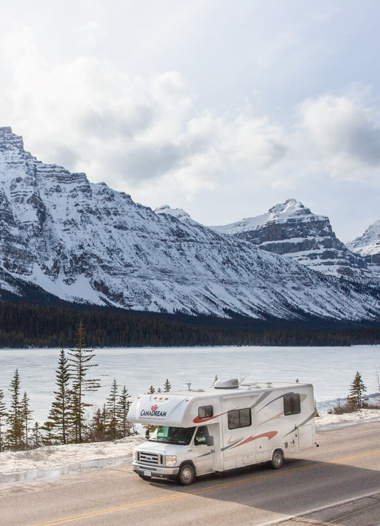 Cruise across Canada in comfort when you rent an RV from CanaDream. Our Class C Motorhomes are perfect for families who need a little extra space. Experience Canada at your own pace without the need to stop for food, or to use the bathroom. A maxi motorhome gives Guests totally flexibility with their RV vacation plans. When the day is done, rest your head, or just relax. Take the worry and stress out of planning a trip when you rent a maxi motorhome. 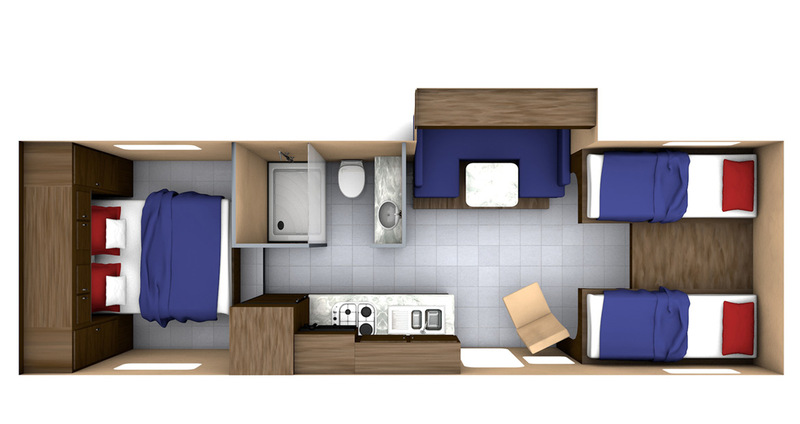 The thoughtfully designed interior of our Class C Maxi Motorhome features a separate rear bedroom with a queen bed and has all the comforts you can expect in a home away from home. The MHA is the best choice for lovers of space. Enjoy the ultimate self-drive experience in this exceptional CanaDream motorhome. This spacious family vehicle boasts smooth handling and is surprisingly easy to drive. A top choice amongst renters! 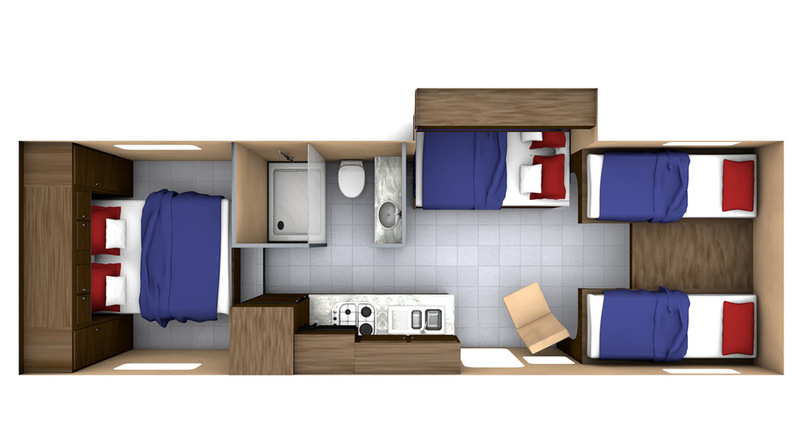 The rear bedroom allows for separation from the living area and the twin overcab beds. Image is representative only of the interior of our MHA. Actual RV received at pick-up may have a slightly different configuration. The fully functional kitchen has everything you need to cook meals on the go. Image is representative only of the interior of our MHA. Actual RV received at pick-up may have a slightly different configuration. The dinette quickly converts into a bed suitable for one small adult or two small children. Image is representative only of the interior of our MHA. Actual RV received at pick-up may have a slightly different configuration. Most of our MHA models have awnings attached which are fitted at the factory during the build process. Please note that these awnings are not available for Guest use to protect Guests against the high cost of repairs or replacement should they be damaged. The overcab beds in our Maxi Motorhome are ideal for both children and adults, offering separate sleeping spaces for two people. The dinette also converts to a bed suitable for a small adult or two small children. Image is representative only of the interior of our MHA. Actual RV received at pick-up may have a slightly different configuration. The bathroom is equipped with a flush toilet, wash basin and a roomy shower. Image is representative only of the interior of our MHA. Actual RV received at pick-up may have a slightly different configuration. The roomy cab in the MHA Maxi Motorhome provides everything at your fingertips while driving. Many of our MHA Maxi Motorhomes have a comfortable chair by the door for relaxing. Layouts may vary within the MHA category and this specific layout cannot be guaranteed. Custom designed to offer space and comfort year-round, it's in winter that our MHA maxi motorhome really sets itself apart from the rest. Custom designed for winter conditions, the MHA becomes your own travelling chalet - fully insulated and comfortable in temperatures as low at -30C. With heated tanks, four coach batteries, a 30,000 BTU furnace and free generator use in winter months, the MHA allows full use of your sink, shower and toilet, even when temperatures drop below the freezing mark.